Doing science your kids love has never been easier! The delight you want to cultivate in your homeschool isn’t something you have to search for—it’s right under your nose. But when your 8-year-old looks at the “to do” list, does he cheer…or maybe die a little inside? And the one subject you’re leaving out? It’s the missing link that could pull it all together. Science isn’t optional. It isn’t extra. It isn’t a “nice” thing to teach if you can find the time. …you’re giving your kids a solid education that’s also inspired. Engage young minds… and put the FUN back into homeschooling! ENROLLMENT OPEN FOR A LIMITED TIME! 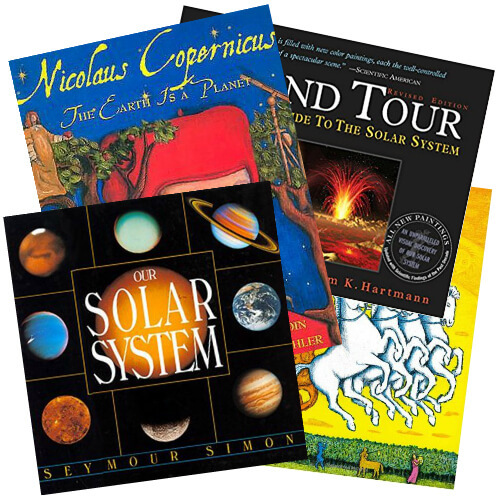 Further your children’s education and love of astronomy by using some (or all) of the books on the reading list. Choose from the list of living books and use them as read-alouds for the family or independent reading assignments for each of your children. For your entire immediate family! I appreciated the ease of sitting down with my kids, opening the video and watching each lesson explained very clearly with lots of interesting historical, geographical, and scientific information. The great visuals on the videos helped us with the concepts being introduced. My kids and I have grown to love science! Thank you for your investment in families like ours. I needed a pick-up-and-go science program with a Christian foundation. I homeschool 3 kids that range in ages from 8 to 11 and wanted something we could do together that wasn’t difficult to understand, but not dumbed down either. Everything in Experience Astronomy is taught through the lens of God’s Word. It’s thorough and engaging, with a great list of recommended reading that really enhances what’s taught. I’m learning almost as much as the children. We’re having amazing discussions about the stars, space, mythology, God, and our place in the universe! What’s Included in the Elementary Program? Lessons can take as little as 15 minutes, or expand to a few hours of fun and learning! The lessons are flexible to fit your family’s schedule. but Experience Astronomy has proven to be a good value and high quality course that all the kids can do together. And knowing we have lifetime access is great because we can go back through it again with my 2 youngest kids after they’re older. …but I’m not a science person and didn’t know how to make science fun. This program has been a lifesaver! It’s opened up a new world to my daughter, she’s asking questions about space, and pointing out things she’s learned to her dad. My daughter’s now enjoying school and both of us have loved learning about astronomy. I’ll be signing her up for the high school program when she’s old enough! My kids look forward to these lessons every week! The lessons make learning about a complex subject both fun and easy. And the videos are well produced, informative, and just about the right length for short attention spans. Luke is personable, enthusiastic, and my kids can relate well to him. Do I need to enroll each of my children separately? No. When you purchase Experience Astronomy: Elementary you may use the course with all the children in your immediate family. You’ll have lifetime access to the course. This means you can pace your kids through the course any way you want or go back and use the course with more kids later on. What ages or grades is this course appropriate for? The class is geared towards kids 8-12 years of age, but younger students may also enjoy the course. For older students, we recommend our Upper Level Experience Astronomy program. As the parent, you are the best person to determine if this class is appropriate for your student. Click on “Preview” above to get a taste for the course. The elementary-level course is designed for students in the elementary grades. Video lessons are shorter than the upper-level videos and taught using simpler language for younger viewers. The concepts taught in the elementary course are more basic, whereas the upper level course includes the basic concepts and goes much deeper. Activities in the elementary course include more hands-on creative projects whereas the upper-level has weekly outdoor observation activities (often in the late evening or early morning) which are more appropriate for those looking for an observational/lab science. 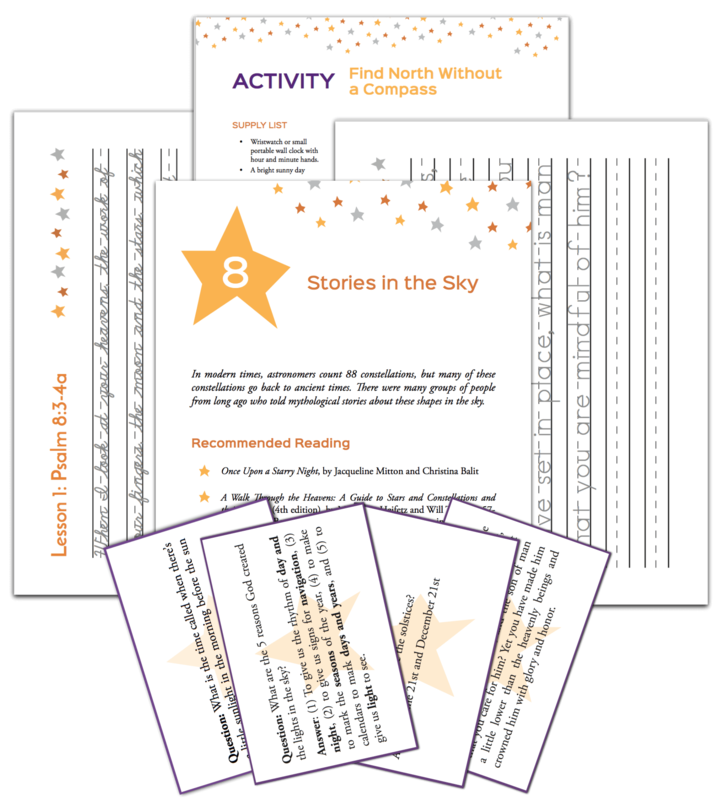 Reading assignments for the elementary course are living books that can be used as read-alouds or assigned as independent reading, geared towards students ages 6-11. The recommended reading for the upper-level is a textbook geared more towards teens. 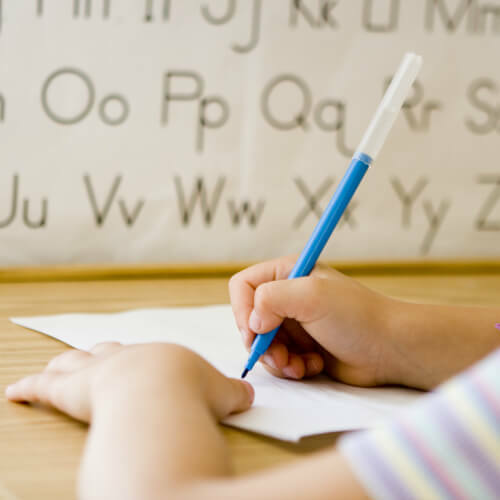 Supplemental activities for the elementary course include things like copywork and memory cards, suitable for elementary level students. Does my child have to view the course videos on specific days or times? Nope! Everything is recorded and will be available for you to watch on your time schedule. After enrolling, when will I get access to the course materials? 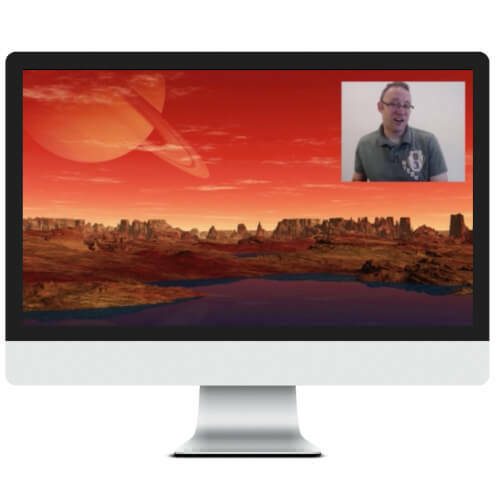 You’ll have immediate access to the entire course as soon as you register. You sure can! We’ve made sure to make the lessons applicable to those worldwide. We’re excited to welcome our friends in other countries to join us as we study the stars—both northern and southern hemispheres. What additional books or supplies will I need for this course? We’ll provide you with a reading list of living books that you can purchase or borrow from your local library. 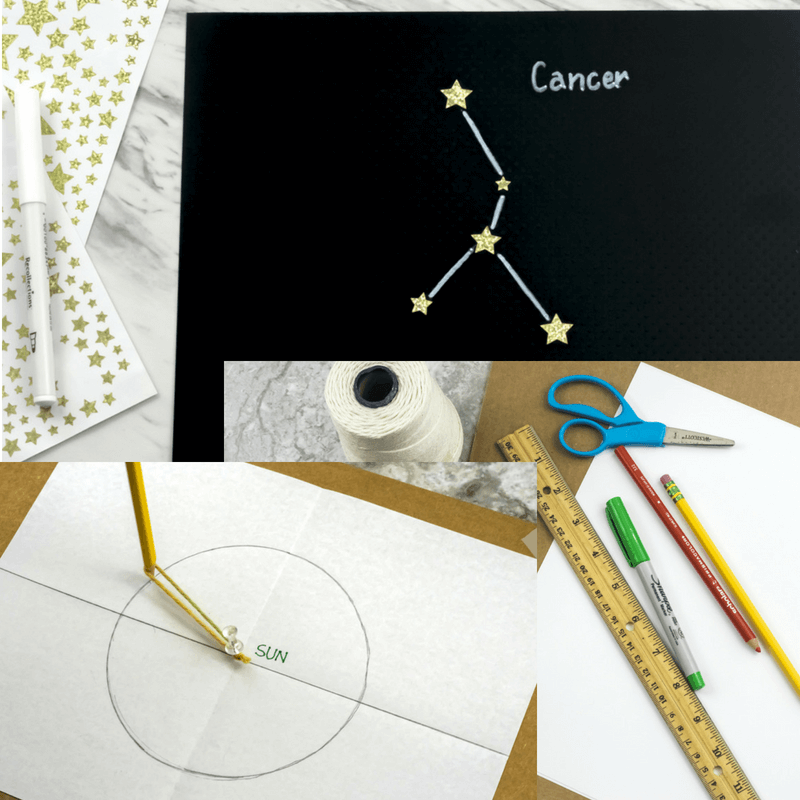 You’ll also have an activity you can complete with each lesson, but we’ve tried to ensure these activities use supplies that are typically found around the house or those that are easily accessible. Please note: The books and activities are completely optional. The program is completely customizable and you can do as much or as little as you like! Do you teach about creation/evolution in this class? Can my public or private school child enroll in the course? Of course! 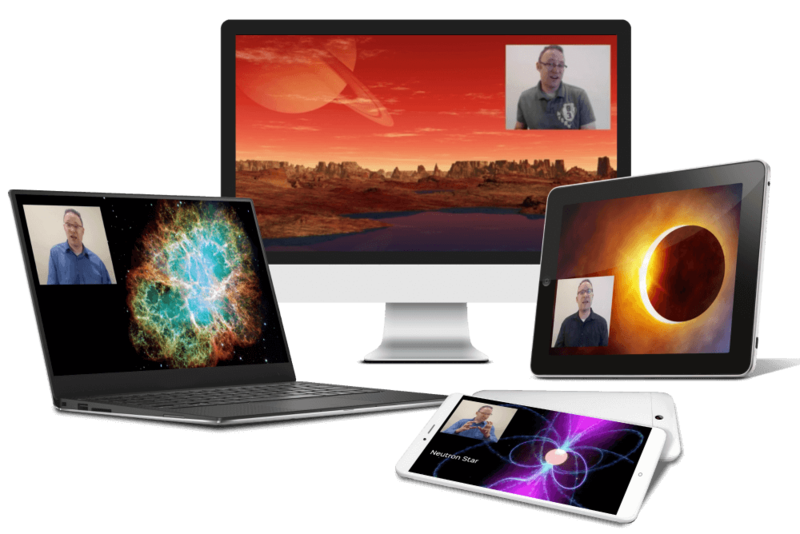 While it certainly is a great course for homeschoolers, this course is great for any student who wants to learn more about astronomy whether they’re homeschooled, public schooled, or private schooled. You have the flexibility to complete the course whenever you’d like! Experience Astronomy is more than a science class. It’s the gateway to engaging young minds and unlocking a love of learning. 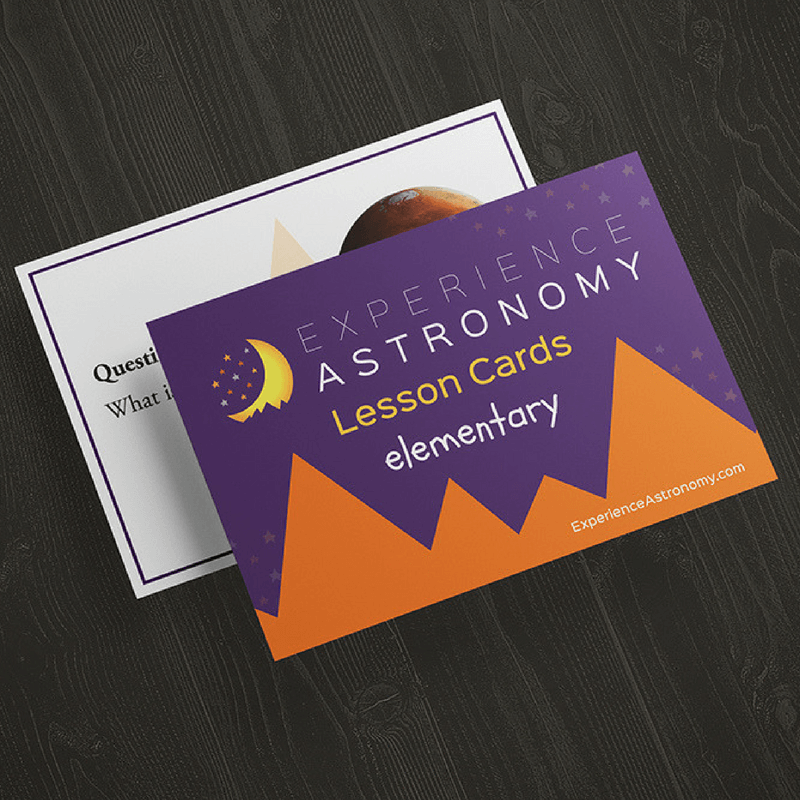 Experience Astronomy provides a great and easy to assimilate science into even the busiest of weeks. I liked most of all that we could sit down and learn without a lot of prep time! As a mom homeschooling several grade levels at once, having a course that was complete but didn’t take a lot of my time to prep was important. But most of all, I appreciated that I could trust the content because it was based in Scripture.